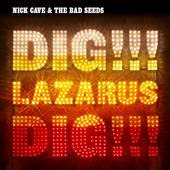 If you are a little curious about the new Nick Cave and The Bad Seeds album Dig!!! Lazarus Dig!! !, now is a great time to check out his my space page and listen to the new album in it's entirety for free. I guess if you like it, go out and buy it, if you don't, no harm done, you still have your money and no one has been ripped off, a nice approach which is why I'm writing about it here. Also don't forget Nick Cave and The Bad Seeds will be performing live and then signing copies of their new album at HMV, 150 Oxford Street, London Monday 3rd March (release date) at 6pm. As far as the new album goes, I was wishing they would have moved on from the biblical references by now. Jury is still out, will write more when I've had a chance to listen a bit more. What do you think of it?